The blue border style Flag of West Virginia on a white field (background) depicts an image of the state seal that is surrounded by a wreath of Rhododendron maximum or "great laurel," the state flower. The West Virginia flag serves as a symbol of honor, heritage and regional pride and is displayed at state buildings. There is an Order of Precedence for flags. State Flags are displayed in order as they entered the Union. modified in 1907 and 1929. Car Flags are often displayed to represent of an individual's allegiance to their state. West Virginia State car flags are used by their owners as mobile emblems of their home. Car flags are usually made from strong materials and are attached to a car via a pole and clip window attachment. 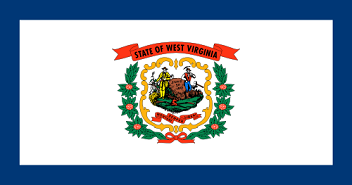 What is the design of the West Virginia state flag? What does the Rhododendron symbolize? 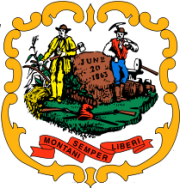 The image on the seal depicts a farmer and a miner with their tools, symbolizing the major early industries of the state. Below the men are two rifles signifying that they have laid down their arms and the picture of the liberty cap on top of the rifles represents freedom. The rifles also represent their readiness to take up arms in defence of their state and the nation. The large boulder features the date "June 20, 1863", the date West Virginia became a state. Who designed the West Virginia Flag? The name of the designer of the seal was Joseph H. Diss Debar. "I pledge allegiance to the flag of West Virginia, which serves as a constant reminder that "Mountaineers Are Always Free," which stands as a symbol of her majestic mountains, fertile forests, rich veins of coal, and the pride of her people." The West Virginia flag is kept and used as required by the code specified in the constitution of the state.